Hello readers! For this post I'd like to show you my attempt on challenge 13 of the 31 Day Challenge: a very literal animal print. It was a bit of an experiment as I used other materials besides nail polish: a Staedtler permanent marker and an Edding Deco Marker in white. 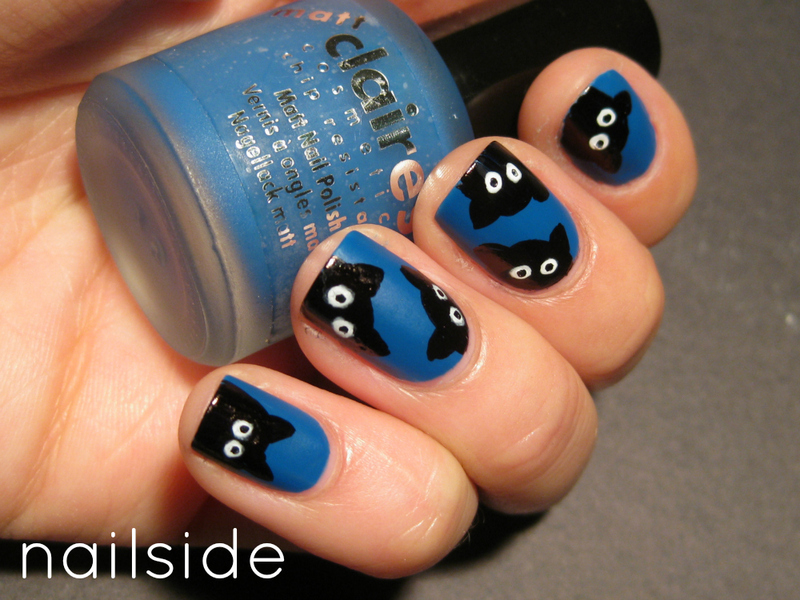 Once the blue basecolor was dry (nameless polish from Claire's), I freehanded the curious animals on top. The markers seemed to attach well on the matte surface, the polish just needs to be completely dry before you can draw on it. OMG! This is sooo cute! I really need such a marker too! Deze is te gek, Jane! Echt een super leuke creatie. So adorable! Reminds me of the kitty doodles I have all over my notes! Very cute, I like how inventive you where using the pens, they came out great! Very cute and original take on this task :)! cute design :) ingenious idea! Lovely idea, those are so cute! I've used markers before and they left some red dots on my nails... did that happened with you too? Hmm, that's strange. Were you wearing polish underneath it? I used two coats of polish and didn't have any staining at all. I was wearing one thin coat, maybe I'll need two! Love your blog, and your designs btw! omg how cute! That blue is perfect, too! Your cats are so cool and they look great on that blue base! O my goodness. I LOVE this! So smart! omg this is so freaking cute! love this! best animal print mani! Aw I love it - super cute! Haha this is really adorable!! Love it! Wow! These are amazing ;) Did you really draw this cats? Oh this is soooooo cute! 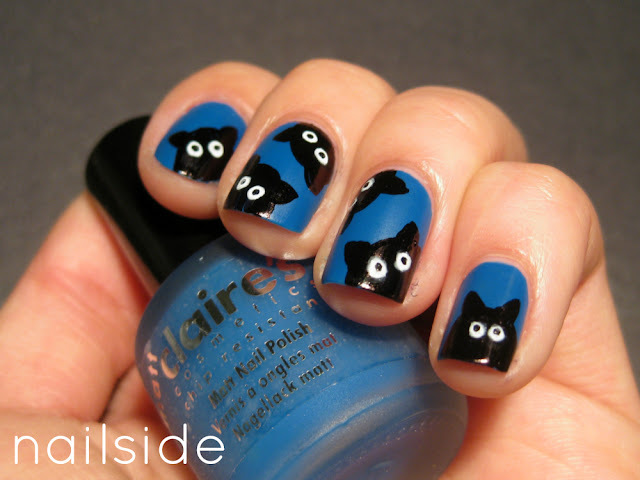 I love cats and have tried a mani similar to this! This is so cool :-) I love it. This is so cute! They look like an imaginary creature to me--mmm, how about Shadow Petz? Haha! What a glorious take on animal print. You get A+ on originality! Super cute! This is so cute and done very well. You always do such a great job of describing how you've done a mani and have given me a lot of inspiration. Thanks for sharing! It's super cute and playful. Definitely the cutest animal featured nails! Love these cuties! Reminds me of the stray cats stalking our neighbors! Unique take on animal print BTW. 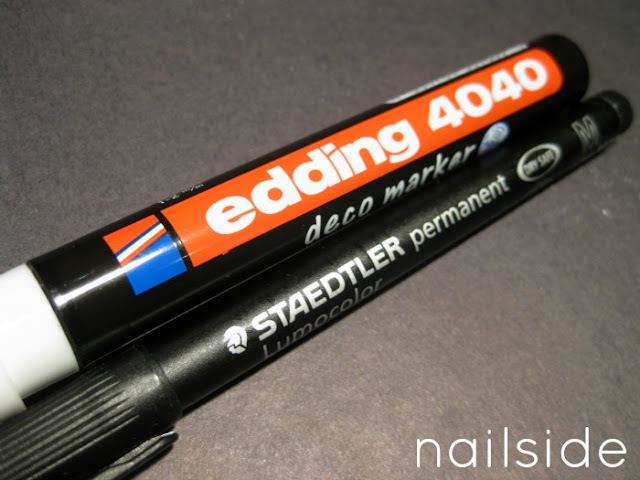 Did you use a top coat? I have tried markers before, but they always bled with a top coat. I didn't use this brand though.